Today’s post is another our series on the book Excess Returns, and looks at how successful investors go about buying and selling stocks. In Chapter G of his book Excess Returns, Frederik Vanhaverbeke looks at buying and selling stocks. In part 9, where we looked at how to deal with the various types of stock. In this section we will therefore re-cap only the main points. Top investors distinguish themselves through their thorough and serious due diligence.They question their own opinion by checking all that could go wrong. The vast majority of cheap stocks are cheap for a reason. Top investors are selective and try to avoid losing stocks and speculative situations. They will hold a lot of cash if they can’t find investments that meet their own criteria. 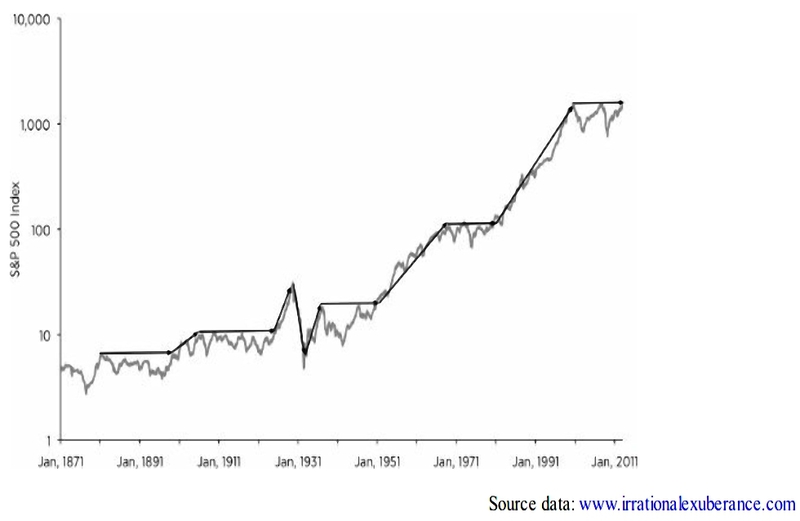 Top investors also accumulate positions over time, since “a stock’s fair value is noisy”. This is especially true of lower conviction and / or riskier ideas (fast growers and turnarounds). Some top investors (particularly value investors) are happy to average down while their investment thesis remains valid. This is a dangerous tactic for the average investor (see here for more details). It involves waving goodbye to a profitable stock, or admitting that the purchase of a losing stock was a bad decision. In the latter case, you also have to fight psychological biases telling you to hold on to losers until you get your money back. the estimated intrinsic value falls below the current stock price. This requires constant monitoring and can be prone to error since the intrinsic value is hard to calculate accurately. A third condition would be that the original investment thesis no longer seems valid for some reason (usually new information about the company or about economic conditions). This requires keeping an investment diary to recall the original thesis. Many top investors sell before intrinsic value is reached (say at 90%). The last 10% of the valuation gap is often closed very slowly. Growth investors will hang on to an “outstanding business” as long as the growth is there. Value investors are critical of growth, and are more likely to sell as a business closes in on its intrinsic value. Top investors often sell gradually, since they don’t know where the stock price will move over the short-term. Private investors often use a variation of this approach by “top-slicing” stocks that have breached the maximum weighting threshold within their portfolio (usually in the range of 4% to 10%). An alternative approach is to use trailing stops and sell the stock when it runs out of steam. This can be psychologically easier to implement. Chapter H of the book is about dealing with market cycles. As we all know, markets exhibit short and long bull and bear cycles. The short cycle of which most people are aware, generally lasts a few years (say 5 to 10), of which perhaps two-thirds will be bull and one-third will be bear. There are also range-bound (sideways markets) where stock prices can go nowhere for a decade as PE valuations slowly decline from high levels. In such markets, buy-and-hold doesn’t work, and a more active approach is better. This will involve selling “early”, before intrinsic value is reached. In bull markets, buy-and-hold is the way to go. Some people try to time bear markets by getting out into cash, but this is difficult. Even more difficult is deciding when to get back in. A bull market is defined as a 20% rise from a bottom, and a bear market is a 20% fall from a top. Prices don’t move in a straight line, and there will be corrections (in bulls) and rallies (in bears) – temporary moves against the longer-term trend. The chart shows five cycles in the S&P 500 from 1963 to 1992. They vary in intensity and duration. 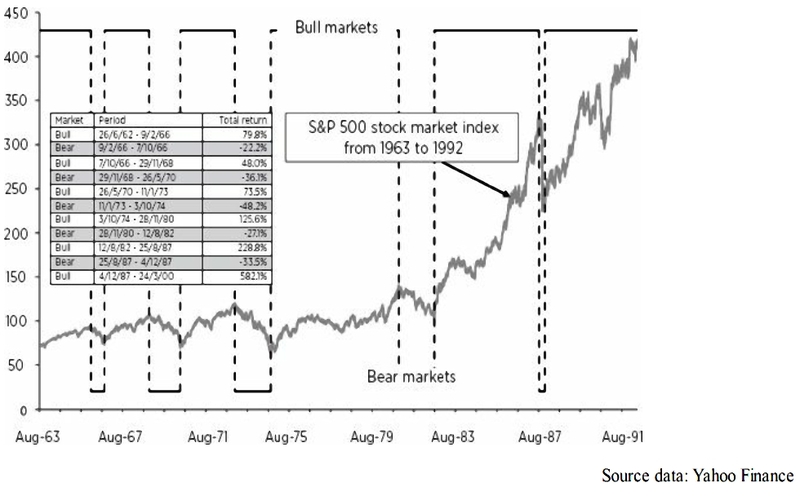 The 1973 bear was severe (almost 50% drop) but the 1987 crash was steeper. The 1987 to 2000 bull showed a gain of 600%. The longer-term chart shows “secular” cycles, which can be bull, bear or range-bound. During these, PE multiples respectively expand, contract quickly or contract slowly. Secular bulls usually rise above previous bull peaks, but secular bears don’t revisit previous lows. Top investors see market cycles as opportunities to buy cheap and sell expensive. Buying opportunities arise at the end of bear and range-bound markets, when stocks trade below intrinsic value. This is straightforward to understand, but difficult to do. Ordinary investors are more likely to buy near the top and sell near the bottom. There are five indicators used by top investors to judge where we are in a market cycle, which we will examine in turn. Sentiment will be massively positive at the top of a bull market and massively negative at the bottom of a bear market (and somewhat negative and apathetic at the end of a rangebound market). Public interest in stocks will peak with the bull and bottom with the bear. This corresponds to every wannabe buyer having no more money to put into the market, and every seller having sold. Top investors will take the opposite position to the prevailing sentiment. Useful indicators of tops include excessively strong price action in increasingly frequent IPOs and also in speculative, low-quality stocks in general. You can also look at the ratio of bullish to bearish market analysts, and the MA of the put/call option ratio. Anthony Bolton used to monitor the cash positions of mutual funds (low cash = optimism = bearish signal). Another peak signal is investment fund advertising which stresses recent performance. Market tops are also usually associated with loose credit. Valuation metrics are not particularly good at predicting short-term performance. The Shiller CAPE is a good example here. Long-term predictive performance is much better. Nevertheless, top investors look at the divergence of valuation metrics from historical averages, since they must inevitably revert to their mean over time. When the market yields more than bonds, it is cheap. This one sounds good, but doesn’t have a great long-term predictive record, probably because it says more about interest rates than stock prices. Anthony Bolton and John Templeton were fans, but accounting conventions, goodwill and inflation all limit its predictive value. This should be better than P/BV, because it uses the current cost of assets, removing the inflation and accounting issues. James Tobin’s q-ratio is the most popular metric, and has good predictive value. Note that Buffett is sceptical, since often the replacement cost of assets cannot be realised in a fire-sale. This is Buffett’s favourite measure – P/GNP should be between 70% and 80%. This is not a good measure since dividends are driven by the payout ratio. Earnings yield (Fed model) is superior. Some people count stocks, or use a percentage, others use a market cap approach. The value needs to be compared to its historical average – more passes than usual means cheap. Other imbalances provide useful readings for sectors more than for the market as a whole. Useful indicators include: GDP growth, inflation, commodity prices, car sales and levels of inventory. John Templeton predicted the dot com crash by looking at when the lock-up periods of tech-IPOs would expire. But there is little evidence that they work. So in this sense it is worth looking for what that shock (catalyst) might be. For top investors, the fundamental issue is the value-price disparity. They start buying in bear markets when valuations have come down. Since it’s hard to pinpoint the bottom, they buy all through the bear market. Many top investors wait on the sidelines during bull markets. Note that this can lead to years of underperformance. Even during bulls, there can be sections of the market that are forgotten and undervalued, so not all investors will abandon the market completely. Some move partially into cash, or at the very least, stop buying when their value metrics aren’t met. Selling is done gradually, starting with the most overpriced stocks. One approach is to regularly rebalance back to a fixed allocation to stocks (say 60%), which automatically means you will sell during bulls and buy during bears. Others increase the allocation to cash as prices increase. Rather fewer investors go beyond hedging and actually go net short. Again this can be done against the index, the most overvalued sectors, or a diversified basket of the most overpriced stocks. When people flock to the hot stocks in a bull market, they may sell off other sectors to fund their purchases. Of course, undervalued sectors can become even more undervalued when bull turns to bear. An alternative approach is to monitor the market-cap indices and move between large and small caps according to their relative value. The human brain is wired against successful investing over market cycles. So you need to control your emotions and act rationally. At tops there will be optimism, and at bottoms pessimism. They don’t believe in new eras and new fundamentals. They know that it’s never different this time. If you can’t take a loss, you shouldn’t be in the stock market. Frederik ends the chapter with a summary diagram. The two chapters we’ve looked at today have been relatively disappointing by Frederik’s high standards. Most of the stuff on buying in particular had been covered earlier in the book. 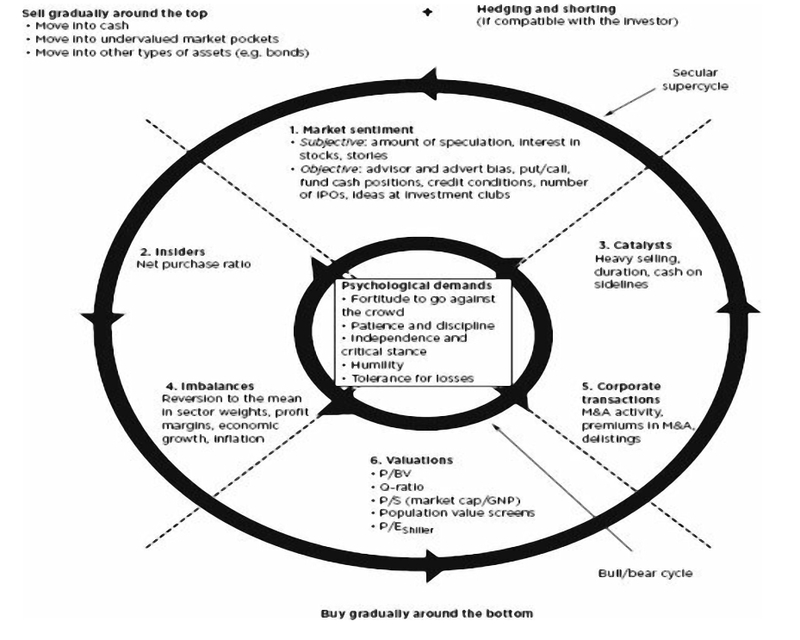 And the approaches to selling and handling market cycles show more variety than in other chapters. In the end though, I think there’s enough useful information to make the journey worthwhile. We’re more than 80% of the way through the book now, with probably two more articles to come. I’ll be back in a few weeks with Mistakes and Risk. Previous story BPR Industry Review – An Alternative to DIY AIM for IHT?